The main and virtually exclusive legislation in Sweden that governs class actions (hereinafter referred to as group actions, in accordance with the official Swedish to English translation) specifically is the Swedish Group Proceedings Act, which came into force in January 2003. The act is only applicable to civil cases and procedural matters thereof; it does not affect substantive law. In addition, where the Group Proceedings Act does not specifically regulates otherwise, the general framework that governs litigation in Sweden (found mainly in the Swedish Code of Judicial Procedure) is applicable to group actions. Owing to the narrow scope of the Group Proceedings Act, the Code of Judicial Procedure to a large extent de facto covers group actions. For a number of environmental and competition matters, a few provisions relating to group actions can be found in the Swedish Environmental Code and the Swedish Competition Damages Act. All group action proceedings are adjudicated by judges; there are no juries. public groups (i.e., authorities, provided that the authority is suitable to represent the members of the group with reference to the subject of dispute). Group actions are administered by the general courts, which are organised in a three-tier system: district courts (and in the case of group actions, specifically by the district courts appointed by government, with each county having one), courts of appeal and the Supreme Court. However, competent district courts for group actions relating to environment matters and competition matters are the land and environmental courts or the Patent and Market Court respectively. Group actions are based on an opt-in system; each member of the group must within a time frame decided by the court give notice to the court if he or she wishes to take part in the group action. 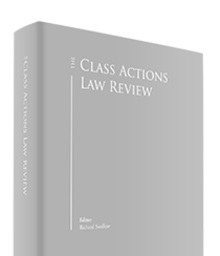 Group actions pursued under the Group Proceedings Act are rare in Sweden; only 16 litigation proceedings have been commenced since the Act came into force in 2003. One explanation why this is the case could be that the general procedural rules regarding intervention and consolidation of proceedings are fairly liberal under Swedish procedural law. Anyone who can make it probable to the court that the disputed matter has an impact on his or her legal rights or obligations may intervene in a pending court proceeding. The rules on consolidation are more complex, and there are several ways in which two or more court proceedings can be consolidated, some of which are mandatory. Mandatory consolidation is normally applied if the same claimant initiates more than one court proceeding against the same defendant or if one or more claimants initiate proceedings against one or more defendants, if, under all these circumstances, the claims are based on essentially the same legal ground (e.g., the same contract or the same negligent act). The most prevalent reason for consolidation in other situations is that a consolidation would benefit the handling of the court proceedings, but this type of consolidation is not mandatory. It is not unusual that, for example, claims regarding professional liability for financial advisers that have provided advice to a vast number of consumers are consolidated with support of the procedural rules of consolidation instead of being filed as a group action. Courts may not ex officio decide whether consolidated proceedings should instead be pursued as a group action, although such a change is possible under certain conditions upon request by the claimant. A further reason specific to competition matters as to why group actions are rare in Sweden may be that the statutes of limitation have been unfavourable to claimants prior to the new Competition Damages Act that was enacted in 2016. There were no group action claims filed in Swedish courts during 2017. An initiative that received some attention was a potential group action against Volkswagen regarding the emission controversy; however, it has since been abandoned. Consequently, no trends can be discerned other than that the interest for group actions in Sweden remains at a low level. Any civil claim that can be brought to general courts may be subject to group action, for example, virtually all commercial disputes. Any other type of claim may not be brought as a group action unless such opportunity is available by statutory backing. There is statutory backing for group actions in several environmental and competition matters. Notable matters that may not be litigated as group actions are maritime, patent, trademark and a number of employment matters. The Group Proceedings Act is, with a few exceptions, applicable to environmental matters where it is permissible to bring a group action, for example, claims concerning damages. One of the exceptions is that public groups (i.e., authorities) are restricted from pursuing certain remedies; public groups may only bring claims concerning damages. Private and organisation groups may, in addition, bring claims concerning the prohibition of environmentally hazardous activity and claims to order the defendant to take protective measures or other precautions regarding such activities. Moreover, non-profit associations that, in accordance with the association's charter, protect environmental interests - as well as associations of professionals within the fishing, agricultural, reindeer and forestry industries - are entitled to bring an organisation group claim to court, in addition to what follows from the Group Proceedings Act. Limitation is part of Swedish substantive law. As was mentioned above, the Group Proceedings Act does not affect substantive law. Consequently, general statutes of limitation apply. The general limitation period is 10 years from the occurrence of a claim unless otherwise is agreed upon by the parties or specifically regulated elsewhere, according to the Swedish Limitations Act. Some areas of law are subject to specific limitation periods (e.g., under certain circumstances, matters of product liability). The limitation period can be interrupted if the debtor offers payment, pays interest or instalments or otherwise acknowledges the claim. The creditor may also interrupt the limitation period by presenting a written demand to the debtor or commencing legal proceedings. If the limitation period is interrupted, a new limitation period begins from that day. Concerning interruptions because of legal proceedings, specifically, the new limitation period begins when the legal proceedings are concluded. Generally to avoid limitation, it is sufficient to notify the opposite party of the claim, although in some instances initiation of court proceedings is required. the claimant, taking into consideration the claimant's interest in the substantive matter, financial capacity to bring the group action and other circumstances, is suitable to represent the members of the group. The group members themselves are not parties in a group action, with the exception of the representative of the group in private groups (i.e., the actual claimant: the representative of a private group must have a claim that is subject to the group action). However, a group member is in several aspects treated as a party (e.g., in matters relating to conflict of interest and evidence). Notably as well, a group member has an independent right to appeal in his or her own interests or in the interests of the group. How such appeals are administered is a complex issue, but they entail that the group member becomes party to the proceedings. Theoretically it should be possible to involve more than one defendant in group proceedings. The Group Proceedings Act does not specifically regulate this situation although it may be deemed inappropriate as regards the prerequisites in (1)–(5) above (however, these prerequisites primarily concern the claimant and the group members). The group is preliminarily defined by the statement of claim. Consequently, a group can be defined fairly loosely at an initial stage, for example, 'everyone who purchased cars from X in the year of 2016'. Ultimately, however, the group is defined by those members of the preliminary group that decide to opt in. There are no specific provisions in the Group Proceedings Act concerning claimants outside Swedish jurisdiction, hence ordinary rules applicable to individual claims apply to group actions as well. Issues concerning jurisdiction are primarily resolved with reference to international legislation or treaties or, in absence thereof, national sources of law; see further below. Group actions may be funded in primarily three ways: ordinary contingency fees, contingency fees arrangements under the Group Proceedings Act and third-party funding. Lawyers that are members of the Swedish Bar Association are generally prohibited from requesting contingency fees, according to the Swedish Bar Association's Code of Conduct. Exemptions may be granted only for very specific reasons, making contingency fees very rare. the fee is not based solely on the value of the relief sought. Contingency fee arrangements according to the Group Proceedings Act are not binding to the defendant. Accordingly, any costs incurred by the claimant specifically as a result of a contingency fee arrangement cannot be recovered from the defendant in accordance with the general loser-pays-principle according to general Swedish procedural law. There are no general restrictions to third-party funding under Swedish law. Members of the Swedish Bar Association are, however, de facto restricted from funding a party's costs themselves owing to restrictions imposed by the Swedish Bar Association's Code of Conduct. There are no restrictions for a member of the bar to act for a claimant funded by a third party. It is worth noting that because of a Supreme Court precedent in 2014, owners and representatives of special purpose vehicles (SPVs) may, under certain circumstances, be held liable for the defendant's litigation costs where the SPV arrangement is made for the purposes of circumventing the loser-pays principle established in the Code of Judicial Procedure. There are no specific court proceedings of certification prior to a group action being initiated. In practice, however, the court will ex officio decide on various issues (including the general prerequisites for initiating court proceedings set out in Code of Judicial Procedure) where a group's statement of claim is filed. A party is not required, but permitted, to raise objections regarding issues that the court will assess ex officio. Specifically for group proceedings the court will, inter alia, make the following inquiries. Most importantly, the court will assess whether the claim is appropriate as regards the issues outlined in (1)–(5) above. Generally, the court will only render a formal decision concerning these issues either if the claim is rejected by the court without prejudice or the court dismisses an objection raised by the defendant. Either outcome is possible to appeal. In addition, group actions brought by a private group or an organisation must be represented by an attorney who is a member of the Swedish Bar Association. There is no such requirement for a public group, and it is not unusual that such group actions are brought by in-house lawyers of the authority bringing the claim. The court may grant exemptions to the member of the Bar-requirement where special reasons apply. Accordingly, the court will inquire whether the claimant's attorney is a member of the Bar. The court will also assess any contingency fee arrangement made under the Group Proceedings Act and how each of the group members will be notified the group proceedings. As was mentioned above, the Group Proceedings Act has no application on substantive law. Consequently, issues regarding quantum of damages and liability, etc., are resolved in the same way as in any individual action where several parties are involved. Under Swedish law, it is permitted to split issues of liability and quantum of damages, that is, to first bring a declaratory claim regarding the issue of liability to the court and in subsequent proceedings, assuming liability applies, bring the issue of quantum of damages. However, any declaratory action brought before the court concerning whether a certain legal relationship exists, for example, whether a defendant is liable to pay damages, must, inter alia, be fitting as regards various criteria. A court shall ex officio decide whether such a claim is permitted. Typically in claims concerning damages, this permission is granted. Issues of liability and quantum of damages may also be split in ongoing proceedings by means of an intermediate judgment. The time frame of litigation in matters that may be litigated as group actions is usually between one to two years in the district court where the proceedings are not a group action. Considering the low number of group actions in Sweden, there is not enough data to draw any conclusions regarding the time frame of group action proceedings. From our experience, group actions may, however, stretch out for several years. As a starting point and in the absence of an agreement on how to calculate damages, the aggrieved party is entitled to its actual loss incurred. As a general rule, Swedish law does not recognise punitive damages. The 'doctrine of difference' is the primary tool in calculating the amount of damages that the aggrieved party is entitled to. According to this principle, the liable party is obliged to pay damages to the amount that puts the aggrieved party in the hypothetical position where it would have been had the damaging act not been performed (i.e., the aggrieved party is entitled to full financial compensation (including loss of profit)). Liability to pay damages is, as a general rule, limited to the immediately aggrieved party; third parties, that is, anyone who incurs financial loss as a result of the aggrieved party's loss, are generally not entitled to damages. In addition, the compensation to the aggrieved party may be reduced with reference to, for example, contributory negligence or failure to mitigate loss. Many of the group actions in Sweden were settled. However one case in which the claimant was successful was initiated in 2008 in the Uppsala District Court. The claimant and each of the 43 group members were awarded damages. The case concerned whether the state had discriminated against the claimant and the group members in application processes to a university run by the state. The judgment was rendered in the spring of 2009 and was affirmed by the Svea Court of Appeal in December the same year. In general, the winning party is entitled to full compensation from the losing party for reasonable litigation costs (e.g., counsel costs, compensation for the party's own costs, costs for experts and witnesses) and interest, but there are exceptions to this loser-pays principle. A group member is, as a general rule, not liable for costs since it is only the claimant (i.e., the entity that represents the group; not the actual group members) that is considered a party. There are a few exceptions to this rule, however: most notably, if the defendant has been ordered by the court to compensate the claimant for its costs but is not able to do so the group members are instead liable to pay these costs. The same applies for additional costs resulting from contingency fee arrangements made under the Group Proceedings Act, as was mentioned above. Each member of the group is liable for its share of the costs and not liable to pay more than what it has gained through the proceedings. Generally under Swedish law, a settlement does not require court approval. However, a settlement concluded by the claimant on behalf of the group members is valid only if the court confirms it in a judgment. The settlement shall be confirmed at the request of the parties, provided it is not discriminatory against particular members of the group or in another way manifestly unfair. A group member has the opportunity to settle its claim individually without involving the claimant. It is also possible for the claimant to settle claims on behalf of a the group, namely the claimant is, according to the statutory text, not able to settle claims on behalf of individual group members although it is disputed amongst scholars whether this limitation actually applies. As was mentioned above, it is in theory possible to involve more than one defendant in group proceedings. Theoretically, it should be possible to settle separately between the defendants. As was mentioned above, the Group Proceedings Act does not contain provisions on jurisdiction. Generally, there are no specific issues arising in relation to group members or defendants not being domiciled in Sweden. Jurisdiction must, however, apply to all group members' claims. It follows from the above that group actions may be brought on behalf of group members from several jurisdictions. A Swedish court will ex officio determine whether it has jurisdiction. Generally, the court will examine the statement of claim to establish if anything therein indicates that the court does not have jurisdiction. If in doubt, the court will normally issue a remedial injunction to the claimant to provide opportunity to argue on the jurisdiction issue. Eventually, the court will rule on its jurisdiction based on international legislation or treaties applicable or, in the absence thereof, national sources of law. No particular issues of forum shopping in group actions have as of yet, to the authors' knowledge, arisen in Sweden, which is most likely because of the low number of cases. Forum shopping is rarely an issue in general, however, especially in matters where group actions are feasible, mainly due to the widespread application of the Brussels Regulation and the Lugano Convention on jurisdiction and the recognition and enforcement of judgments in civil and commercial matters of 2007. As was mentioned above, interest in pursuing group actions in Sweden has remained at a low level since the Group Proceedings Act's inception. However, this may change in terms of competition matters as the rules on limitation have been made more favourable to claimants in the new Competition Damages Act that was enacted in 2016. In addition, a group action was recently initiated regarding a claim for damages of roughly 135 million kronor. The claimant and the group members are seeking damages for loss incurred in relation to an acquisition of a company. The preliminary group consists of the shareholders of the target company.